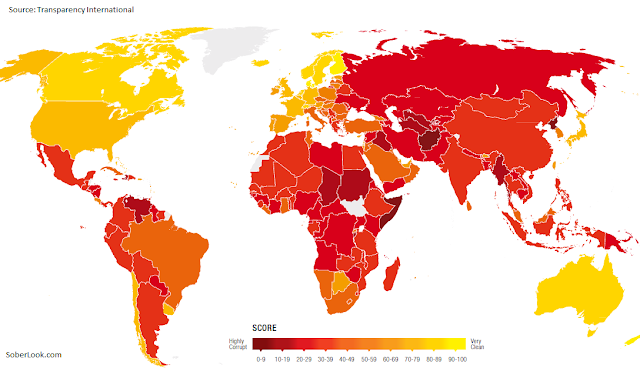 The 2012 Corruption Index is out. Republic of Botswana and Uruguay seem to have almost the same score as the US. Maybe it shouldn't be a surprise. Reuters had an interesting point on the topic. Some of the most corrupt nations (such as Libya) are also some of the fastest growing ones (see this post for 20 fastest growth nations from DB). Reuters: - Uzbekistan, Bangladesh and Vietnam found themselves cheered and chided this week. The Corruption Perceptions Index, compiled by Berlin-based watchdog Transparency International, measured the perceived levels of public sector corruption in 176 countries and all three found their way into the bottom half of the study. Uzbekistan shared 170th place with Turkmenistan (a higher ranking denotes higher perceived corruption levels) . Vietnam was ranked 123th, tied with countries like Sierra Leone and Belarus, while Bangladesh was 144th. Those findings are unlikely to surprise. But consider this. All three countries are said to boast some of the best prospects for business and growth over the next two decades. That’s according to the findings of a separate study released in the same week. Uzbekistan, Vietnam and Bangladesh made it into the top 20 countries with the best growth prospects for business, outranking the United States, a study by political risk consultancy Maplecroft found. China and India continue to rank poorly on the corruption scale. India in particular is not happy with the score. Zee News: - India's ranking in the global Corruption Perception Index is "distressing", Vice President Hamid Ansari today said and suggested fourfold approach to treat "deadly social ailment". "Our ranking in the global Corruption Perception Index is, to say the least, distressing. The disease is not of recent origin but, in an earlier period, carried a social stigma less evident today," Ansari said, delivering Annual Bhimsen Sachar Memorial Lecture on 'Virtue in Public Life' here today. Unlike India however (who has been trying to fight corruption for some time now), most nations who scored poorly seem to be ignoring this measure altogether. In fact the fight against corruption globally is not progressing well.